I was commissioned by the then Chairman of the Works of Art of the Palace of Westminster. He was one of the longest serving conservative members of parliament being elected to the Cannock constituency in 1970 and then changing constituency to South West Staffordshire (now South Staffordshire) until 2010 when he retired and became Baron Patrick Cormack. He asked me to look at the entrance to the parliamentary offices at No 1 Parliament Street which was being re- furbished and for which various works of art were sought. 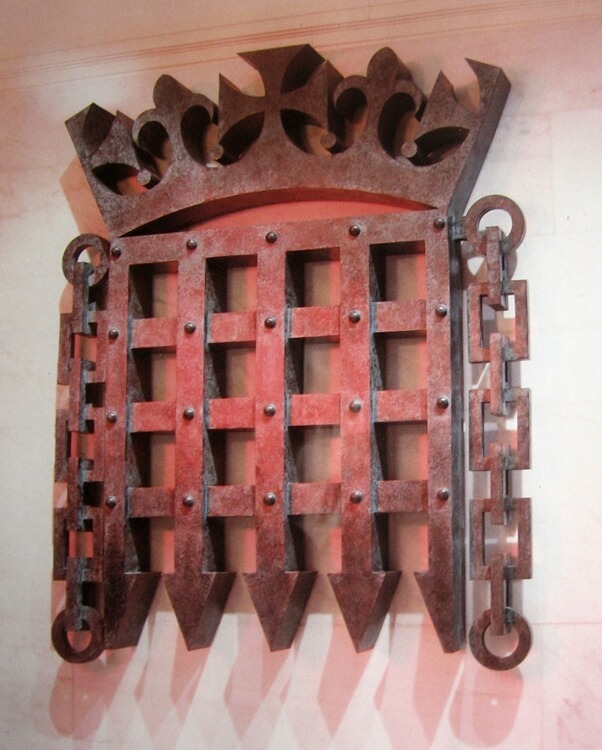 It was thought appropriate to have a sculpture of the Portcullis and Crown in the entrance. I duly made a small pattern and then with Montagues of Slough, who made very accurate patterns for Rolls Royce and other manufacturers, we made a large Portcullis and Crown in wood which was duly sand cast in bronze at the Burghleighfield Foundry. It weighed 4 tons and had to be wall hung! We installed it in the entrance lobby and on November 8th 1991, ( a birthday treat for me), HRH Prince Charles, The Prince of Wales, dedicated a plaque in the presence of a number of leading MPs including Michael Heseltine and Hugh Rossi and the Speaker of the House, now The Baron Weatherill, and the building was opened. My then wife Auriol and I were invited for lunch to Speakers House and the famous architect Sir Hugh Casson was also a guest and came to congratulate us on the work. Then a sharp step backwards… ” I do beg your pardon…are you an artist? People do that to my wife when they meet me… are you an architect too they greet my wife. No. I am an architect she tells them smartly… “I do beg your pardon, I did not mean to belittle you in any way and I think the heroic bronze you have both produced is excellent.” It was a privilege to have been given that commission and another great occasion brought about by being a sculptor. Later when Portcullis House was built we won a competition to have a major work installed there but that commission never came to fruition and that is another story!